Just wanted to give some praise to all of you who have helped me through my golf journey. I started about 3 years ago and hacked my way round the course fighting tops, thins, fats, hooks and slices along the way. Found myself getting lost, lost and more lost on YouTube with the variety of coaches on the prescribing tips for the masses that never fit so didn’t stick. I then found this forum and was blessed to find loads of constructive advice for beginners and more which have helped me with so many issues over the years. I also found Some really enlightening debates on swing theory which initially muddied the waters but eventually cleared my mind. I knew that I did not want that. That really describes where I was at the start of may this year but I still did not know exactly what I wanted. I knew I wanted golf to be fun. I want it to be a sport. I want to go out and play. However, after three years I just did not know what to do. Then a moment of providence I stumbled on a Manuel de la Torre thread on here and it has changed my golfing life. I read all the threads and knew instantly that this is what I wanted. So I watched all the videos available, read all the threads (even all the arguments) read the book and I now feel like I have what I need. So a big thank you to all of you out there who have posted on this forum with well meaning tips, critiques, lightbulb moments, arguments, YouTube clips, more arguments and of course the Manuel de la Torre information that has given me such joy. You have all changed my life. Also, a big thank you to the man himself, Manuel decks Torre, I wish I could have met you and had you give me the feel. God bless. Awesome stuff, bud. Keep grinding and having fun! 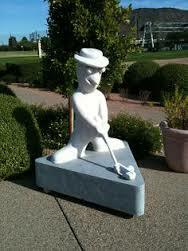 Mcdonl @ welcome aboard, you have found the "holy grail" to your golf. You could do a lot worse than the teachings of Manuel De La Torre. He was and is still a part of my golf journey. Thanks for the reply’s. I’d never posted before as I didn’t feel I had anything positive to contribute. Now I do. Hopefully I can now join in with this busy community. Thanks again! YouTube stuff and I spent several hours just soaking it in. Been playing a long time and I desperately needed simplification in the process. Target focus only and swing shoulder to shoulder ( backswing above the right, finish above the left). It has cleared my mind before and during the swing and the initial results have been very solid.. Awesome! Never expected that to happen! You are welcome.  here’s to you, target focused golf, fun and Manuel de la Torre. Awesome! Never expected that to happen! You are welcome.  here&#146;s to you, target focused golf, fun and Manuel de la Torre. What part of Scotland, if I may ask? My family comes from John Witherspoon from Gifford, East Lothian a few generations back.. The MDLT stuff is great. If you really think about all the technical stuff/methods-it will all just happen naturally if you follow Manuel’s theories. His putting advice is great as well; just roll the ball on your starting line. Awesome! Never expected that to happen! You are welcome. &#55357;&#56842; here’s to you, target focused golf, fun and Manuel de la Torre. I'm live on the Isle of Lewis off the west coast. I was born in Edinburgh though and have family there. Not much in the way of facilities up here. Two courses, one parkland 18 holes, one links 9 holes 50 miles apart, no teaching pros and one driving range with mats directly on concrete floors. Wow, you have an illustrious forefather. I share his sentiments on the centralisation of government. I love the quote in the foreword of the book when the LPGA pro goes to him moaning about her putting and Manuel asks her what she is trying to do. When her reply is 'I am trying to make putts' he tells her not to try and make putts but to simply roll the ball as far as the hole. Brilliant! Awesome! Never expected that to happen! You are welcome. �� here’s to you, target focused golf, fun and Manuel de la Torre. Wow! Sounds like a great experience. It must make you proud to be part of something as significant as commemorating the starting of a new country. When i was 11 or 12 i was chosen along with another in my school to attend the first opening of the Scottish Parliament and I was very proud to be there for that and there was no family connection involved there. A little bit more info on my swing results. In case it can persuade anyone like me to use Manuel's Method. Before I started implementing the method nearly every shot was a straight pull. I tried various methods to correct this pull but it was still present in about two thirds of my iron shots and 90% of my drives. Now i could play to this and get around the course but it annoyed the **** out of me. Now, when i tried to swing the golf club as directed by Manuel i did not try to change my grip as i had read in the forum that it might not be needed. Alas, nearly every shot has a weak fade at best or a slice at worst. I tried to push that out of my mind. It's not a pull i told myself. I then went to the Manuel's book and read about the causes of a slice and adjusted my grip accordingly. It was surprising to me what the adjustment was as when i first started playing golf i used to slice and when i got a lesson from a pro his fix was the exact opposite of what Manuel's book told me. I pushed that thought away and made the adjustment and bam! First shot hook! Second shot hook! Third shot hook! I could not believe it. I had never hooked the ball before in my life. Well not without rolling my hands over a la adding topspin to a forehand in tennis. That really piqued my belief in this. So i then read the part of the book that deals with the cause and effect of hooks and was able to correct the hook into a pretty cool looking draw. Another thing that i'd never been able to do in the past. Bare in mind that this was all within about half an hour at the range. Anyways, I know there will be ups and downs ahead as always and i will not get too far ahead of myself and continue to commit to improving slowly rather than not at all. MDLT teachings are blowing my mind. At first I tried, without changing my grip. Not fully convinced, shanks all over the place. Then i went back to zero, got the book and on my third day with a new neutral grip AND right pinkie barely ovelapping over my right index finger.... my irons are flying high and looooong. It needs to be fine tuned but I have never seen range balls flying that beautifully ever. Just easy, not worried about positions or turns or shifts... just taking the club WITH my hands to the top and swinging with my ARMS, from “here to here”. So easy and simple, crazy.